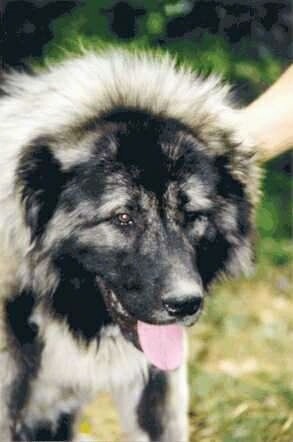 The Caucasian Shepherd has moderate deep-set, dark eyes. The ears are densely covered with hair for insulation. The hips are slightly raised from the line of the back. The tail is profusely covered with long feathering of heavy hair. The forelimbs are long, straight and densely boned. The paws are large and heavy, with hair between the toes, providing excellent insulation and protection. The nose is black and prominent with well opened, large nostrils. The thick, dense, weather-resistant coat has profuse feathering and is especially effective at keeping out the cold. Puppy coats are finer then adult coats. Colors vary from gray, fawn, tan, pied, brindle and white. The FCI prohibits brown dogs. In its native country the Caucasian Ovtcharka's ears are cropped short. The Caucasian Shepherd's original purpose was to protect livestock. The typical Caucasian Ovtcharka is assertive, strong-willed and courageous. Unless properly socialized and trained, the Caucasian Shepherd may exhibit ferocious and unmanageable tendencies. It is very brave, alert, strong and hardy. It does not accept people it does not know and it has a powerful urge to defend. Everything and everyone who belongs to the family, including children, cats, other dogs, etc., will be regarded by this dog as part of "its" family and will be respected and protected. This dog should not be left alone with children, because if play becomes too rough, the Caucasian Ovtcharka my feel the need to protect your child, and may do it extensively. It has no time for strangers, but it will greet family friends warmly. It can be rather dominant toward other dogs it does not know. Some German fanciers employ the dogs as foremost guardians and deterrents. This is not a dog for everyone. It requires an owner who knows how to display strong leadership and who is willing to spend a lot of time socializing and training. The objective in training this dog is to achieve pack leader status. It is a natural instinct for a dog to have an order in its pack. When we humans live with dogs, we become their pack. The entire pack cooperates under a single leader. Lines are clearly defined and rules are set. Because a dog communicates his displeasure with growling and eventually biting, all other humans MUST be higher up in the order than the dog. The humans must be the ones making the decisions, not the dogs. That is the only way your relationship with your dog can be a complete success. 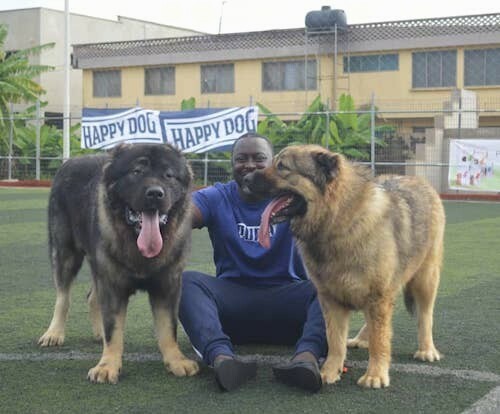 This breed of dog is best suited to a family with lots of space surrounding the home where it can safely run free in an open area. When not working as a livestock guard, it should be taken for a daily, long walk where the dog is made to heel. It should never be allowed to walk out in front of the person holding the lead, as in a dog's mind the leader leads the way, and that leader needs to be the human. 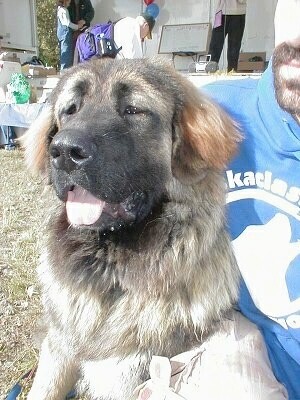 The Caucasian Shepherd is a flock guardian developed from pre-historic molosser breeds in Caucasus by local herders. Caucasians are used to protect sheep from predators and thieves. These dogs always attract everybody’s attention due to outstanding working qualities and a striking appearance. 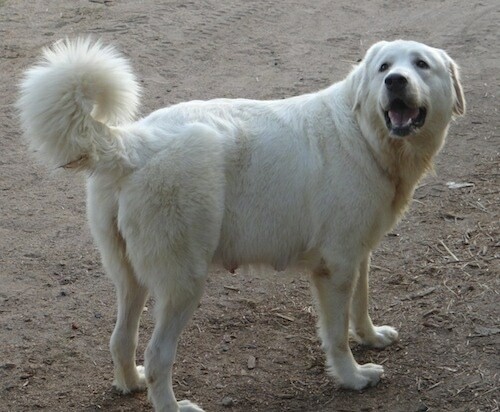 The lack of organized kennel clubs and written standards partly explains why the Caucasian Ovtcharka varied in type from country to country and even from locale to locale. For centuries, flocks of sheep have existed in Caucasia, the mountainous land mass between the Black and Caspian seas and neighboring Turkey and Iran. 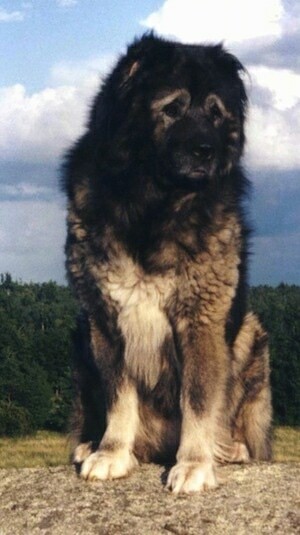 Dogs similar to this superb guardian have protected these sheep from both humans and animal predators for at least 600 years. 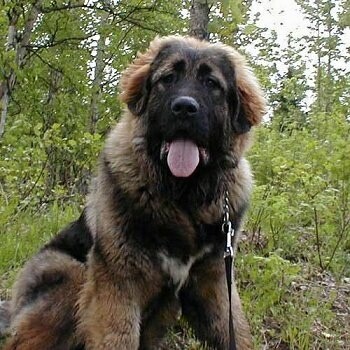 The Caucasian Shepherd is most popular in Russia. "Ovtcharka" means "sheepdog" in Russian. In Russia and other parts of the former Soviet Union, it is commonly shown at dog shows. In Hungary, Poland and the Czech and Slovak Republics, extensive breeding programs are ensuring that it remains a popular dog, even though its original use as a sheep guardian is declining. The Caucasian Ovtcharka arrived in East Germany in the late 1960s to serve as a border patrol dog, especially along the Berlin Wall. In 1989, when the Wall came down, the 7,000-strong band of patrol dogs was dispersed. Many of these dogs were given new homes with families throughout Germany. Careful breeding in Germany safeguards the future of this cautious and independent dog. It is likely that as its popularity increases, breeders will selectively breed out some of the fiercest protective personalities. "This is our cherish Caucasian Shepherd pup named Genghis shown here at 4 months old. He loves spending time with our kids in Accra, Ghana." "Two 3-month-old lovely Caucasian Shepherd puppies named Kane and Abel. They love playing outdoors. We live in Accra, Ghana." 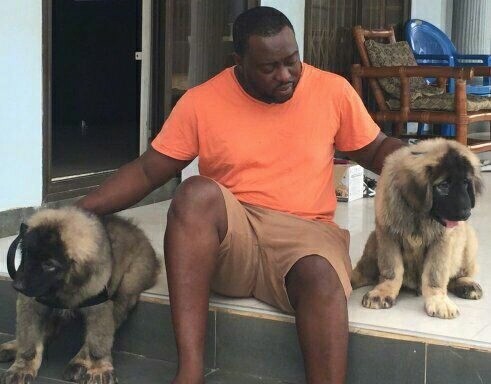 "With our 2 Caucasian Shepherds at a dog show in Accra, Ghana." 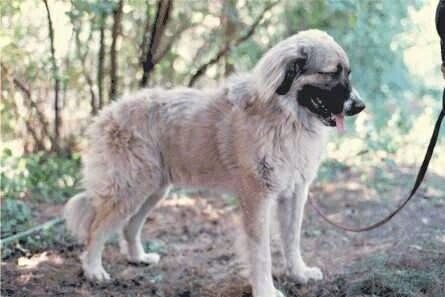 Caucasian Legend Anchara bred Yelena Levitina of Caucasian Legen at 2 1/2 years old weighing 120-125 lbs. She is loved and owned by BabsT. Anchara is an intellegent, loyal, stable protective, fearless, beautiful member of my family. Bee white Caucasian Shepherd Dog at 2 years old—"Bee is very calm and yet a very active guard dog. She alone covers 5 acres of our farm all day with ease. She is very mild tempered but hates trespassers, a perfect dog. We love Bee."